Picturesque St. Patrick’s Catholic church in Lee township will observe the 100th anniversary of its founding at special services this Sunday, October 21. Bishop Edward C. Daly, O. P. Bishop of Des Moines diocese will give the mass at 8:30 a.m., followed by a centennial sermon. Weather permitting, a ham dinner will be served on the church grounds from noon until 2:00 p.m. Sunday. Fr. John Hart is the present pastor of St. Patrick’s parish. It was Father Hart who conducted some extensive historical research this summer and learned that St. Patrick’s church dates back to the year 1852, instead of the previously assumed founding date of 1856. Father Hart has written a complete history of the church and the Irish settlement where it is located, in which he relates that St. Patrick’s is older than any Catholic parish in Des Moines and in the early days served as a focal point for all Catholics in south central Iowa. The first log church at St. Patrick’s was built in 1852, on the 40 acres of land in the southeast quarter of section 32 of Lee township. This quotation is the one which gave the mistaken idea that St. Patrick’s parish was established in 1856. By the year 1868, the original log church has been outgrown, and it was decided that a larger frame church should be built at the Irish Settlement. This new church was built under the direction of Father Brazill, since he still had St. Patrick’s as a mission. 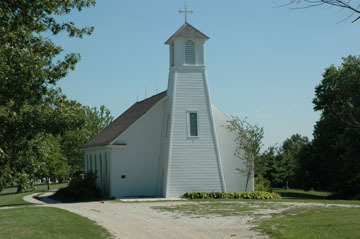 This church still stands and is in use at the present time. In the early days, the parish enjoyed a rapid growth. From February 1874 to June of 1875, Father Patrick Smith baptized 47 infants, and witnessed eight weddings. Early in 1877, Rev. Michael Rice1 was sent to the Irish Settlement, and for the next seven years remained as pastor. In those seven years there were a total of 324 baptisms. One of the more interesting considerations of the St. Patrick’s parish is in the territory which it served. The first pastor was Father Timothy N. Mullen, who made the Irish Settlement his headquarters as early as 1852, and was make missionary extraordinary between Fort Des Moines and Council Bluffs. Since there was no other priest closer than Ottumwa, the territory of the parish was about the same size as the entire diocese of Des Moines today. Some of the men of St. Patrick’s parish, from the earliest times, dedicated themselves to the Priesthood. 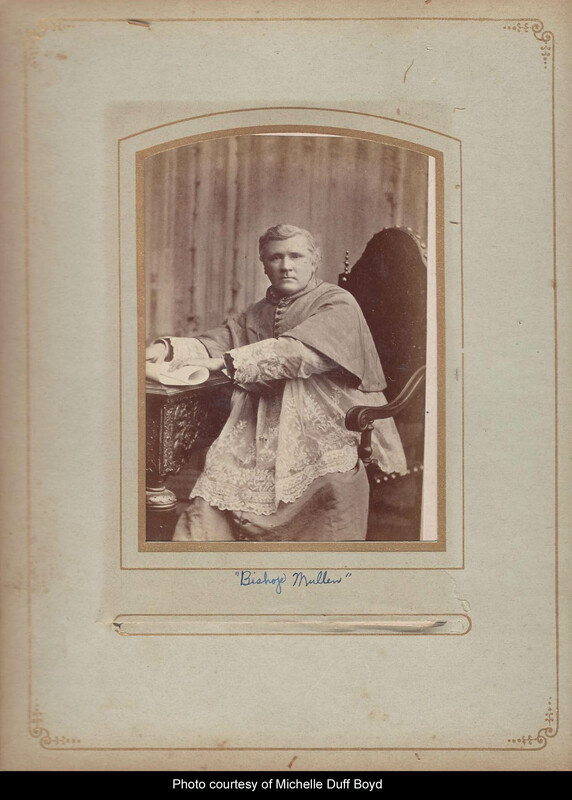 These include Father Daniel Mulvhill, Msgr. Henry Malone, Father J. C. White, and Father John Weill. Young women who left the parish to enter religious life include: Cecilia Durigan, who took the name of Sister M. Victoria; Mary A. Crogan took the name of Sister M. Kiernan; Mary Kiernan took the name of Sister M. Juanita in the order of St. Francis at LaCrosse, Wisconsin; Ann Connor took the name of Sister M. Benedict in the order of St. Benedict in Guthrie, Oklahoma; Agnes Caffery took the name of Sister M. Aquinas with the Sisters of St. Joseph at LaGrange, Illinois; Theresa Cain took the name of Sister M. Angele with Ursuline Sisters of St. Louis, Missouri; Catherine Connor became Sister M. Alberta and joined her aunt in the Order of St. Benedict; Josephine Dooley took the name of Sister M. Sheila with the order of St. Francis of Clinton, Iowa; two sisters, Sheila and Susanne Mulvhill have entered the Sisters of Charity and taken the names of Sister M. James Catherine and Sister M. Susan. Of the approximately 40 families that now make up the St. Patrick’s congregation, about 85 percent can trace their ancestry back to the early settlers. Some families are still on the farms first claimed by great grandparents. Actually, in a few cases, there is the sixth generation in the Irish Settlement. Taken from an article published in the Winterset Madisonian, date unknown. 1. "Michael Rice", identified as "Martin V. Ryan" in the 1880 Lee Township census, is "Martin V. Rice" per the official Dubuque Diocese record. This page was created on September 19, 2006. This page was last updated Wednesday, 09-Jul-2014 11:56:36 EDT .